Bitlocker is the disk encryption system for Windows. It allows you to encrypt both internal, and USB-connected hard disks and Flash Drives, securing data, files, and documents from theft. Remote Desktop allows you to use your PC as window into other PCs, where you can control them remotely. Hyper-V is Microsoft’s virtualisation technology, allowing you to install different versions of Windows and different operating systems that run wondowed, or full-screen on your desktop, for testing or other purposes. Business Features that come with Windows 10 Pro can be essential for connecting to your company network, including Private Catalogue, to access company apps from their own Microsoft Store, and Domain and Azure Active Directory joining features. 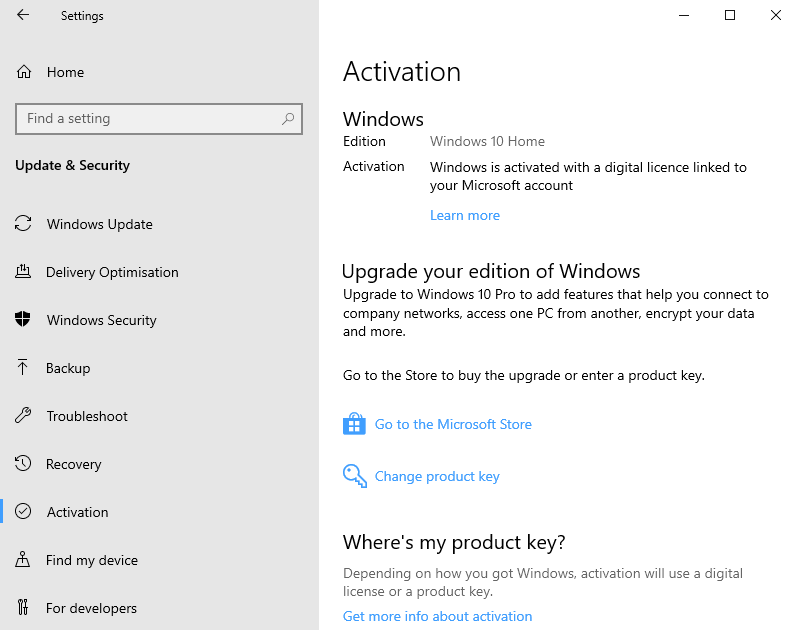 If you want to upgrade your copy of Windows 10 from Home to Pro, open Settings from the Start Menu and navigate to Update & Security > Activation. Here you will see two options to upgrade. If you already own, or have been given by your workplace, a product key for Windows 10 Pro, click the Change product key link. 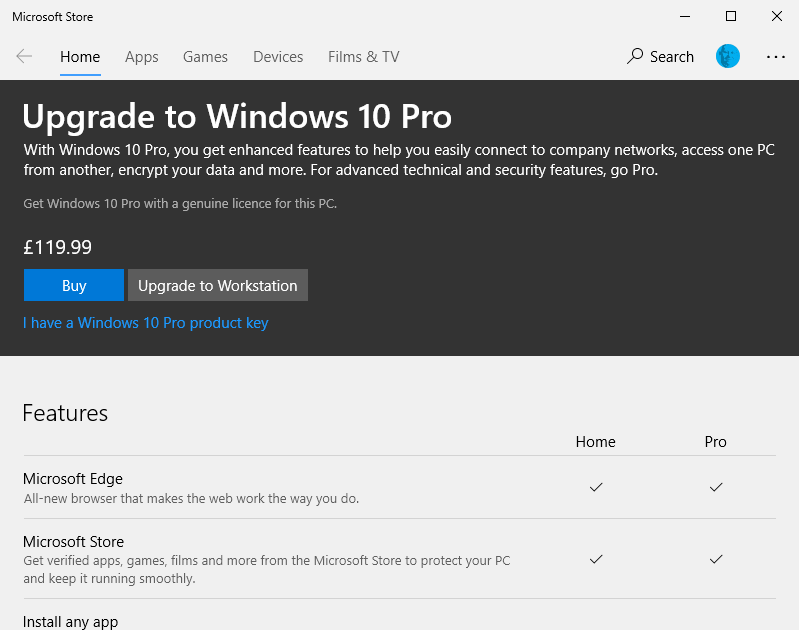 To buy a new licence for Windows 10 Pro, click Go to the Microsoft Store. When the Store opens, you will be presented with a Buy button and the price for the upgrade to Pro. Additionally, you can also upgrade to the Windows 10 Pro for Workstation edition. This is designed for more demanding hardware, and you can read more about it at the Microsoft website on this link. The actual upgrade process requires restarting your PC, but only takes a couple of minutes. After which you will have Windows 10 Pro installed on your machine. If you sign into your PC using a Microsoft account, this information will be stored in Microsoft’s servers so if you ever need to reinstall Windows in the future, the Pro version will be automatically activated.